Dainty Dollymix UK Beauty Blog: Bags, Bags, Bags! If you know me or have been reading my blog for a while you know that the one thing i love over beauty and make up is handbags! I am a sucker for a beautiful bag and i have really been loving the unique handbags from Boticca.com. 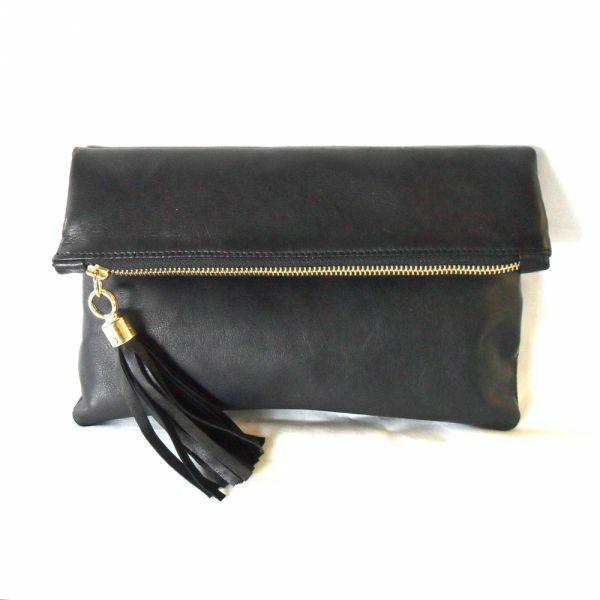 In particular this Gretchen Midi Black Clutch Bag by Miller and Jeeves on Boticca. I do love a good clutch bag and i usually opt for one that is cream or black. This is extremely simple yet i do love the black and gold together along with the tassle on the zip, although you can opt for silver hardware if you prefer. It is from and made in Oxfordshire too (Some of the accessories/bags on the website are international however you can select just from the UK if you prefer) and shipping is free which is always a bonus! This clutch is made of lambskin so is 100% leather exterior with a shocking pink cotton lining and this particular bag retails for £98 which i don't think is too pricey especially as it is handmade and real leather. Its beautiful and my kind of bag! Boticca is a online boutique for unique jewellery and fashion accessories by designers from around the world. It is basically a marketplace of emerging designers and puts them all in one place so you can search by country or accessory and then narrow them down further by colour, material, price etc. I have my eye on quite a few things! Especially some of the gorgeous, dainty jewellery that i have spotted for such a reasonable price! What bags do you prefer to carry? Are you a clutch or shoulder bag kind of girl? wow nice but i perfer shoulder bags bettre but this clutch is also amazing <3. to Balenciaga, Italian handbag designers and labels continue to dominate the race to the world's amazing hermes birkin kelly handbags . In any color, style, size and design, Italian handbags are always sought for their unparalleled impact in cheap louis vuitton handbags accessorizing casual to formal ensembles. If you are looking for a stunning omega speedmaster watches to indulge in, you can never go wrong with these bags. But since best christmas gifts are priced above the ordinary, you might be interested to know just about cheap rolex watches how to get the best deals out of these hot season items. The Blue Modern Everyday Shoulder Bag is another Ladies Shoulder Bag that includes a nice variety of admirers. Within the Vintage Tapestry assortment, the Clutch purse has no comparison even whereas comparison it to the Nineteen Sixties Designer Leather Bags on-line blue pocketbook.